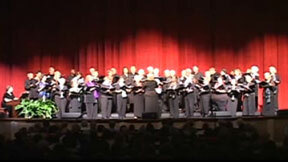 The Elkhart Community Chorus is a choir made up of music lovers in the Elkhart Indiana area. What started out as a choir whose membership was made up of Elkhart High School Alumni (and was formerly called the Elkhart Alumni Choir) has grown to include anyone who enjoys participating in a group of serious choral singers. Previous experience in a musical group is not a requirement, but most of our members have some choral or other music experience, such as a church choir, high school music, or experience with a musical instrument. We are welcoming new members. If you want to join just fill out the ELCOchorus member form and come to the next rehearsal! Our practices are fun, educational, and guaranteed to fulfill your joy in singing. See the calendar page for rehearsal and performance dates. Watch our debut performance as the Elkhart Alumni Choir on June 17, 2011 at the Lerner Theatre grand opening in Elkhart, IN. After this performance we organized as the Elkhart Community Chorus. Contact Craig Nelson if you have any questions. The Elkhart Community Chorus is accepting new members. If you would like to join us, click on the sign-up form link below and come to the next rehearsal. Click here if you are interested in joining! The next rehearsal for our 2019 Spring season will be on Thursday, April 25 (6:30 to 8:30 PM) at St Paul's United Methodist Church (405 W Beardsley Ave, Elkhart, IN). We are asking for a $20 donation when you pick up your music folder. The nusic and folders will need to be returned at the end of the season. If you're interested in joining, click here to sign up! If you participated last season, you know how much we accomplished and how enducational (and fun) it was. If you missed last season – it’s time to get back in the game. If you like to sing and you're looking for a group of friendly, talented, and fun people - join us! We're planning for several performances this season. This’ll be a fun-filled, wonderful time! Our schedule for this season is (generally) one Thursday and one Saturday each month See the calendar page for complete schedule. We may add some rehearsals if needed. Mike Wade will be directing us again this season. This is a wonderful opportunity as Mike has LOTS of experience directing and teaching including the Indiana University South Bend Chorale and Chamber Choir, Crown Point, and Elkhart Memorial High Schools. We will be working on some new songs and revisiting some of the songs that we've done in the past. If you'd like to join our group, fill out the sign-up form or contact Craig Nelson at cnelson@elcochorus.org. Please check the Calendar page for a listing of events and rehearsals. You can listen to our Winter 2016 season's music performed by the ELCO Chorus by clicking here. Our rehearsals are scheduled for selected Thursday evenings from 6:30 PM to 8:30 PM and selected Saturday mornings from 10:00 AM to Noon. Please check the Calendar page for the current schedule!